If you are looking for Eat, Pray, Love or Julie & Julia at the bookstore – STOP. Pick this up instead. It’s friendlier, wittier, and far more relaxing. It was the water color that got me first. 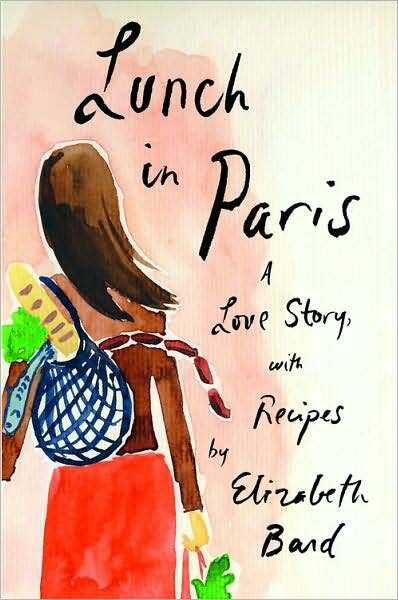 That and the fact that I love memoirs with recipes, they pretty much dominate my source of kitchen plans. Then, that first page of that first chapter: Coffee, Tea, or Me and her description of herself – I felt so at home, so in league with a kindred spirit. She says things like “I stood pressed against the wall, like a field anthropologist caught in the middle of a buffalo exorcism,” when describing a French dance party. How can you not fall in love with a writer that expresses herself like that? I literally started laughing out loud, and I hate using that phrase since all the texters in society have begun speaking how they type, so when I use it I really mean it. Bard is pleasant and loveable. She has dilemmas that I can sympathize with, as opposed to Gilbert’s laments in Eat, Pray, Love which seemed all a little over the top and self inflicted. I did laugh a few times when she chalked something her husband did up to his being French, a lot of times it just seemed very husbandy to me. But for the most part, I think I was only laughing when I was truly meant to, when she utilized some turn of phrase or told a story that should make the corners of your mouth twitch while you read. My favorite moment was when a friend tells her she can’t just go to the market for the rest of her life. Before Bard got a chance to say it herself, I inwardly pleaded… why not? It doesn’t matter whether you loathe or love the grocery stores here in the states, Bard will make you fall in love with European markets and long desperately to go make purchases at a butcher shop in Paris and linger over vegetables in the streets. Go. Buy. Enjoy. I know you’ll love it. In a bowl mix a lot of butter, sugar, and more cocoanut shavings. Dollop mixture onto top of each muffin. Immediately put in the preheated oven and bake on 400 for 30 minutes. Mix and pour into greased muffin pan. Top each muffin with chopped walnuts and immediately place in preheated oven at 400 for 30 minutes. In a bowl mix a lot of butter and sugar. Dollop mixture onto top of each muffin. Bake on 400 for about 25 minutes. Layer into small casserole pan – lemon juice (from lemon), butter, sage, dill, chicken wrapped in onion slices, more lemon juice, honey, more butter. Bake slowly until cooked and serve with rice and corn. In a small casserole pan – Pour Creamy Italian Dressing over chicken until the chicken is good and buried. Slice some onion and one small tomatoe over it. (Stir that into the dressing good so the onion slices don’t blacken in the oven, we want them to stay good and juicy as they bake!) Bake until cooked! Serve with buttered spaghetti noodles and garlic toast. I poured the excess juice from the pan over my pasta as well once it was in my bowl and sprinkled some parmesean cheese on top. I am due to have a kid in October. No, I don’t know the gender yet. Yes, I am going to find out – we just couldn’t tell at the last ultra sound. With a new person coming into the house, my husband and I are committed to cooking more meals at home. I already have some staple recipes of my own, and I have some my Grandmother and Mother-in-law have promised me, but I want to have a vast collection. I could get cookbooks (which I have plenty of) and I could seek some out with google searches, but I wanted to at least feign some personal attachment to our home cooked meals. So please, post your most famous, your most beloved, or just plain easiest recipes here – from dinner menues to baked goods. I want my kid to grow up with good eatin’! 9) Does anyone have a homemade pizza recipe? How do I make dough from scratch? I Can Do Brilliant Things With a Chicken! So it looks absolutely disgusting, but I promise, it tastes oh so good! Have some honey-buttered toast for dessert.